What’s new and exciting this month at Honolulu's luxurious getaway. Celebrate Easter with a surprise visit from the Easter Bunny at The Veranda’s special Tea service on Saturday, April 20 from 10:00am – 1:00pm. Families will delight in delicate finger foods and sweets such as King Crab & Bacon Deviled Egg Sandwiches and Coconut Cupcakes made specially for this festive afternoon. In addition, a kids’ menu will feature classic treats such as PB&J sandwiches, Ants on a Log and Easter Egg Sugar Cookies. *Prices do not include tax and gratuity. Reservations required. To make a Reservation, call 808.739.8760. Enjoy a taste of The Kahala at the Administrative Professional’s Appreciation Lunch Buffet at Plumeria Beach House. In recognition of secretaries, receptionists and assistants, this all-you-can-eat Lunch will feature a daily rotating menu from April 24-26, 11:30am – 2:00pm. Guests can choose from a diverse selection of culinary creations such as Norwegian Salmon, Corn & Potato Chowder, Thai Seafood Crunch Salad and the Steamed Island Catch, Hong Kong Style. In partnership with Hawai‘i Food & Wine Festival, The Kahala Hotel & Resort celebrates flavors from around the world with a 10-chef grand tasting event featuring celebrity chef Rick Bayless on April 26. Kicking off its ninth annual festival season, HFWF honors Bayless, the seven-time James Beard Awardee and winner of season one of Bravo’s Top Chef Masters, as its second Culinary Hero at the HFWF official launch party, No Borders. Grab a much-coveted ticket to taste his exceptional Mexican cuisine, plus dishes from nine of Hawai‘i’s best chefs inspired by their heritage, for a culinary passport to explore the unique flavors of the Philippines (Sheldon Simeon of Lineage), Italy (Daisuke Hamamoto of Arancino Ristorante Italiano), China (Xue Chong Ruan of Tim Ho Wan), Britain (Anthony Rush of Senia) and more. $150 per person, inclusive of sales tax, gratuity, and fees. The Kahala’s new Direct Booking Bonus rewards you for booking directly. 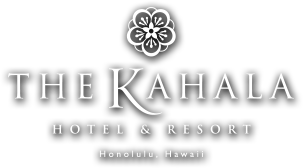 Receive up to $100 per day in daily resort credit and elevate your experience when you book your stay on KahalaResort.com. Splurge on an extra drink by the pool, sign up for a SUP yoga fitness class or book your reservations at Hoku’s. The options are limitless. The Kahala has everything you could possibly wish for in a tropical beach resort, and much more. There’s something to suit everyone, whether you’re visiting for business or pleasure, relaxation or stimulation. Meet the dolphins in our private lagoon, relax by the white sand beach, learn to surf or scuba, and take an exercise class overlooking the ocean. There’s even The Keiki Club for the little ones. Described as “immediately embracing” The Kahala’s accommodations offer lavish comfort, fine finishes, luxurious bathrooms and a choice of scenic, dolphin lagoon and full ocean views. There’s something for everyone to enjoy - experience life at the Kahala. The Kahala Hotel & Resort is deeply committed to preserving Oahu’s land, ocean and culture for generations to come. So together with the Hawaii Legacy Reforestation Initiative, a non-profit organization, we created the Kahala Initiative for Sustainability, Culture and the Arts (KISCA). The Kahala Hotel & Resort features its own collection of retails shops that offers a carefully curated selection of authentic souvenirs, tropical apparel, handmade chocolate, signature gifts and so much more. Enjoy more island shopping at the nearby Kahala Mall, Waikiki, or Ala Moana Shopping Center, an easy complimentary shuttle ride for hotel guests. A feast for your taste buds, experience the restaurants at Kahala whether you are looking for date night at Hoku’s, working lunch at Plumeria Beach House, lounging poolside lunch at Seaside Grill, or Afternoon Tea service at The Veranda, we have a dining experience for your occasion. The Kahala welcomes kama‘aina and guests from around the world to experience the aloha spirit and beauty of Hawaii. Limited rates, dining events, spa offers and fitness memberships just for our special kama’aina. © The Kahala Hotel & Resort 2019. All rights reserved.